While companies focus on hiring employees who possess the skills they need, sometimes that isn’t possible. That’s why many companies offer training on a number of skills that many would consider an essential part of a good employee. But with more and more employees entering the workforce without these skills, it’s important to include the cost of this training in your learning & development budget for 2019 if possible. Considered a “soft skill”, time management is crucial for employees to understand. While the concept is simple (being on time), executing can be a struggle, especially for employees who are new to the workforce. Coming from university, new employees may have gotten used to the idea of asking for extensions or relaxed expectations. Training them on time management in general, as well as your company’s expectations, can help everyone in the company. When one employee is late on delivering something like a report, it can cause a ripple effect. For example, if an employee in accounting is behind on reconciliations, it can keep other employees from finishing their reports — increasing the closing period by days. Teaching employees how to properly organize and manage their time, track their tasks and deliverables, and creating schedules is important to a well-working organization. We’re all making hundreds, if not thousands, of decisions a day. We’re choosing when to wake up, what to wear, what to eat, what route to take to the office, what to listen to on the commute...the list goes on and on. That leads to many people facing decision fatigue. They’re making so many small decisions that the larger decisions can feel daunting. But without the skill of decision making, nothing will get done. While time management is often an issue for new employees, decision making can be a real problem for middle management. They’re moving up the corporate ladder and start facing harder decisions. If you have employees struggling with this skill, consider offering training on effective and efficient decision making. The importance of standardized testing has been so emphasized over the last few decades that many employees lack the important skill of creativity. While it’s often overlooked, especially in the hiring process, it’s crucial for employees to master. Too many employees do the same tasks they were taught without questioning if there’s a better way for it to be done. You want employees who can come up with innovative ideas. When a problem arises, the creative employees are the ones to come up with a solution quickly, because they are able to think outside the box. Being able to come up with new ideas, new processes, and new procedures is essential to a successful organization, so be sure to encourage employees to embrace creativity through training. 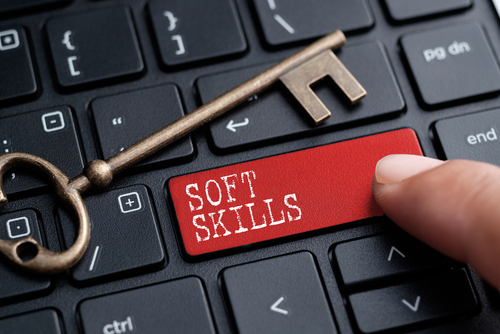 These are just a few of the soft skills that are becoming more and more important in the workplace, so don’t forget to include them in your training budget and schedule!